I'VE always liked turkey, even if some people think it's a totally tasteless bird. I suppose it all depends on the stuffing and rub used on its skin. I have been eating it since I was little, so even today, I eat it as a sandwich, although usually what restaurants serve in their sandwiches are white meat. Btw, Thanksgiving is a common celebration in a lot of European countries and in some form or another in Asian and South African countries as well, because it traditionally celebrates good harvests. But why turkey on Thanksgiving? One web site I read said when the Pilgrims/Plymouth colonists and Wampanoag Indians celebrated the first Thanksgiving in 1621, they had other food served than just turkey. One story goes that roast goose was actually the traditional bird to celebrate good harvests in England. 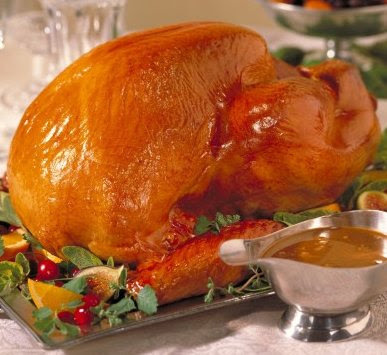 But in America, there were more wild turkey available than geese, so turkey became identified w/ Thanksgiving. In Saipan, where I worked for a year, I was able to attend a Thanksgiving feast w/ some Pinoys. I was happy for the turkey, which was served along w/ lechon and leche flan. Coolness. Hankering for a more authentic American Thanksgiving dinner (okay, I just couldn't have enough turkey, yumm! ), I went to one of the restaurants and ate turkey again w/ some pumpkin pie. (It was so long ago I can't remember if I liked the pie.) Stuffed, and happy at experiencing some kind of American holiday, I went home w/ still more turkey in hand, for the next day's baon at the office. Here in the Philippines, we don't actually have Thanksgiving as a tradition in November, although some hotels and restaurants capitalize on it and offer turkey dinners to their dining patrons. But we do give thanks for our blessings during Christmas. So there are families, like mine, who've served turkey, alongside the regulatory baked leg of ham, lengua estofada, quezo de bola, chocolate eh, and ensaimada. This year, we decided to forego the turkey (sniff!) primarily because we have yet to find someone or some establishment in the Alabang area (where we celebrate Christmas) w/c roasts it well. (Santi's last year was just too chaotic and couldn't give us a straight answer when we could pick up the bird.) The only other roaster I know of, and w/c we've used in the past, is in Makati w/c is just way too far for Christmas Eve pickups. For a few seconds, while my sister and mother were discussing the Christmas menu, I did think of roasting the bird myself. As an amateur cook, I always like challenging myself to experiment w/ certain difficult dishes. The thought, as I said, lasted no less than 10 seconds as I realized that roasting a bird would just be too much stress for me. So I will not have my roast turkey this year, and will have to get my fix some other way. How depressing. Meanwhile, if you want to read up on the pressures of cooking a Thanksgiving dinner, the NYT is hosting a Live Thanksgiving Blog by one of its food writers. The entries so far are quite amusing, and makes the reader feel thankful we don't get that crazy on this day. Except during Christmas boo-hoo. And while it's not a Filipino holiday, I still want to wish everyone, especially my friends and family residing in the States, Guam, and Saipan, a Happy Thanksgiving. And I give thanks for my loving weird family, my crazy fabulous friends, and all the great blessings I continue to receive through the year.